A sharp crystal evening, golden sunlight casting long blue shadows. What a joy to arrive in Lower Slaughter and wander along the river with only the ducks, the jackdaws and a few hardy visitors for company. The jackdaws seem at home in the trees along the River Eye, occasionally descending to hop along the rooftops or to peer at discarded bread crumbs with their grey heads at an angle. Slaughter is thought to be a corruption of slohtre, a marshy place. 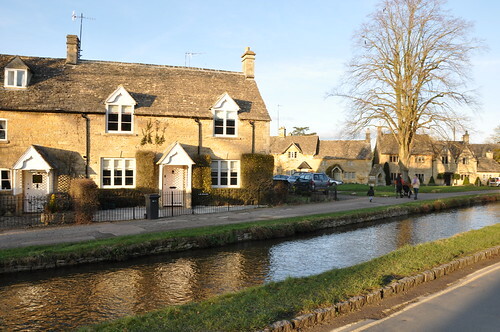 Many visit Bourton on the water fewer travel an extra mile to see Lower Slaughter it’s smaller, quieter but equally picturesque neighbour. Stone cottages line the north bank of the river with a small green at their centre, this miniature area of grass is known as The Square and has a Gothic drinking fountain as it’s only adornment.The clear stream water is only visible as it eddies round the piers of the low stone bridges that span it’s broad flow. Follow the canalised river to the upper end of the village and you will find a 19th century brick corn mill with white water crashing over the mill race and 15ft water wheel still turning with the flow. On the opposite bank towards the middle of the village are the Village Hall of 1887 and the National School by Edmund B. Ferrey 1871. Near where the road crosses the river the south bank is dominated by large and luxurious-looking hotel. The church was rebuilt in 1866-7 by Benjamin Ferrey, the design draws on Early English and Geometrical Decorated styles and though it replaced a picturesque medieval building with a saddle-back tower the Victorian design sits well among the more ancient stone buildings that surround it. Only a Transitional Norman north arcade survives with scalloped capitals and waterholding bases joined by pointed double-chamfered arches. The church has a nave with a north aisle, chancel, south porch and a west tower with broached spire the tip of which was replaced in 1998. Elegant black marble shafts ornament the chancel arch but a similar use of marble in Ferrey’s east window was lost when Hoare and Wheeler provided a new east window and an Italian alabaster reredos depicting the Crucifixion in 1910. Next to the altar a 13th century piscina survives from the older church. The stone font and pulpit are part of Ferrey’s design and there are areas of floor tiling by Godwin. The east window has glass by James Powell and Sons and they provided the attractive design in the north aisle. The west window of the north aisle and the west tower window are by Clayton and Bell 1867. Most of the memorials in the church commemorate the Whitmore family who occupied the neighbouring manor House for more than 300 years. The west tower has six bells, one of c.1450 by Robert Hendley of Gloucester inscribed Santa Anna ORA Pro Nobis St.Anne pray for us. Two are dated 1683 by Edward Neale of Burford and three of 1867 by John Warner and Sons of London. To the north-east of the churchyard is a 16th century dovecote which is said to have held 1000 birds.